According to HireRight’s ninth annual Employee Background Screening Benchmark Survey the main reason drivers are leaving the industry is for better pay followed by more home time and better benefits. A recent article on TIME calculated that the average trucker earned over $110000 annually when adjusting for inflation. Today that number has come down to somewhere around $40000 while requiring longer hours and providing less job security. This shouldn’t come as a surprise to anyone with any knowledge industry as many believe the driver shortage stems from this very issue. However 21 percent of drivers say they are leaving the industry due to health issues which presents a completely different set of problems that the industry will have to address. Numbers from a 2014 survey showed that 69 percent of long-haul truckers were obese and twice as likely to be diagnosed with diabetes compared to the rest of the U.S. workforce. 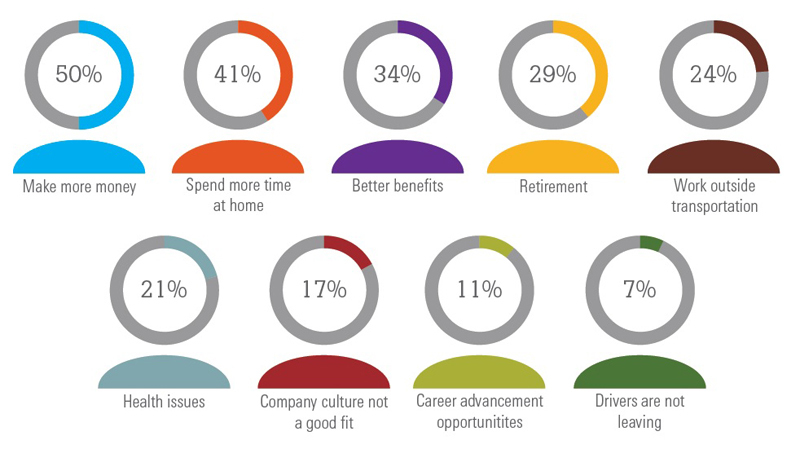 Many companies will have to refocus their retention strategies; 45 percent of respondents said their company does not offer a wellness program and only 12% said their companies offer free access to nurse or health counselors. How do you stay healthy while on the road? How can trucking companies help its drivers improve their health? Share your thoughts with fellow drivers on CAD’s Forum!